I’ve always found shish kebabs fascinating. Perhaps it is the spear like action of the metal skewer onto the meat, or because they are very easy to cook, as they will cook very evenly if you only cook each side 2 or 3 minutes. Maybe there’s also the mix of the meat with the veggies, or the color combination that’s always very attractive. 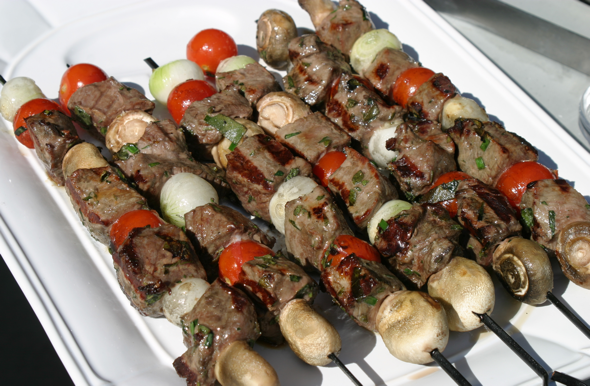 There are many types of skewers, metal or bamboo, but for meat, my favorite choice is to use the flat metal ones. The flat section helps ensure that the items on the skewer will not turn more than you turn the skewer! That tends to be frustrating and awkward! – 1 1/2 lbs of meat, about 1″ to 1 1/2″ thick that you can cut into cubes. Sirloin, london broil, chateaubriand are good candidate, but eye of round will also work great.